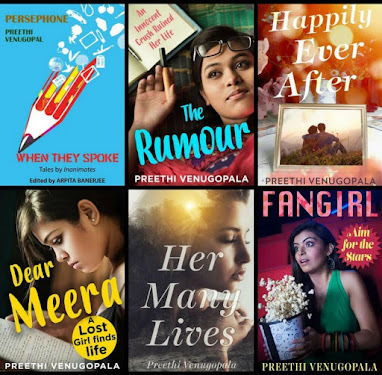 What makes this writer happy? Coffee and my latest discovery, the range of products from Instacuppa. Don’t we all wish for a healthy and energetic lifestyle? Yet many of us are forced to consume bottled soft drinks just to drag us through a hectic day. The result is often just opposite of what we crave: deteriorating health, fatigue and obesity. Around the world, coffee is the fuel of writers. I am no different though I am a late comer into the world of coffee lovers. Getting up from the desk to brew some coffee is a must but then the lengthy process of brewing a coffee will break the flow of writing. Fruit infused water was an easy alternative but I still crave my coffee. That is when I discovered Instacuppa. A friend recommended Instacuppa range of products to me as I am a fan of coffee and detox drinks. Both fuel my creativity and keeps me tapping on the keyboard with ease and happiness. Do you think you can brew a perfect cup of black coffee within 4 minutes? If your answer is no, it is time you tried the Instacuppa French press Coffee maker. Bid goodbye to cloudy coffee. The high-quality metal filter on this French press coffee pot leaves no grinds in the brew, and it is super easy to make. Add coffee powder, hot water and use the French press to filter out the grinds. Super easy, right? Check out this video to know more. The product promises durability as it has an extra tough heat-resistant borosilicate glass carafe that doesn’t break as easily as the others. Its high grade 18/8 stainless steel components that keep rust at bay. It has 600ml capacity and we can brew 6 cups in just one press. The plunger mechanism is super smooth making it easy to use. The best part is that all the materials used in the manual coffee tea maker are FDA-approved and meet stringent international quality standards. The sleek and timeless design of this French press will add beauty to your kitchen as well. 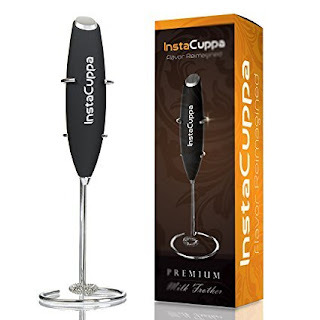 Let me introduce some of the other products from Instacuppa that I absolutely loved. Ever seen a flask with a fruit infuser? Check this one out. Not only does this flask keep water cold up to 24 hours, but the insulated fruit infuser rod adds the extra benefits of the regular fruit infuser. 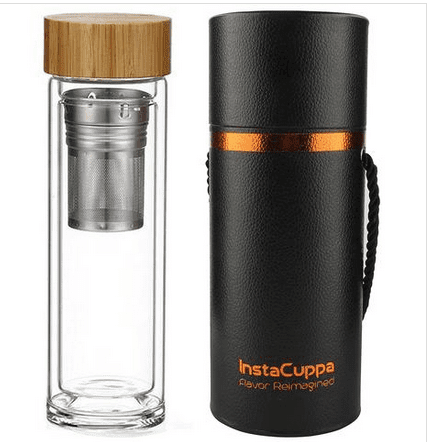 Check here to check out the Instacuppa Thermosteel flask/bottle. If you love green tea, you will love this infuser bottle from InstaCuppa. It is double glass walled and hence would keep the green tea hot for a long time. This milk frother helps to make milkshakes and drinks easily. Also, it helps to even make the perfect scrambled eggs by frothing it just the right way. It is handheld, cute, easy to clean and also dishwasher safe. And guess what, it has a 1-year warranty as well. There are many other products at the site which is on a mission to bring more and more people towards a better health. 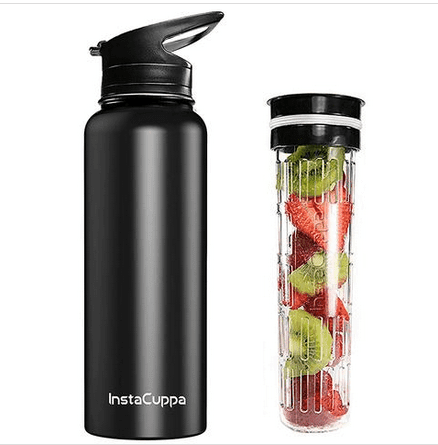 For example, the InstaCuppa Fruit Infuser Water Bottle is another must buy. Let me go drink some coffee to fuel the writer in me further. What is your fuel? Coffee, fruit-infused drinks, green tea? Which one of the Instacuppa products are you going to purchase? 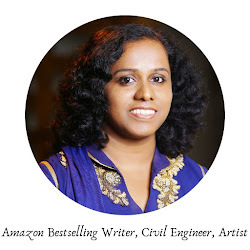 NOTE: This article is written as part of the #SuperBloggerChallenge2018 by #Instacuppa conducted by HealthWealthBridge.com, FashionableFoodz.com and AllAboutTheWoman.comand should not be repurposed, republished or use otherwise. The content herein is owned by the blogger. SuperBloggerChallenge2018 is not responsible for any infringement caused. I agree that we authors/bloggers need rejuvenation from time to time. Tea works for me. #Instacuppa has really promised solutions to cater rejuvenation to us. 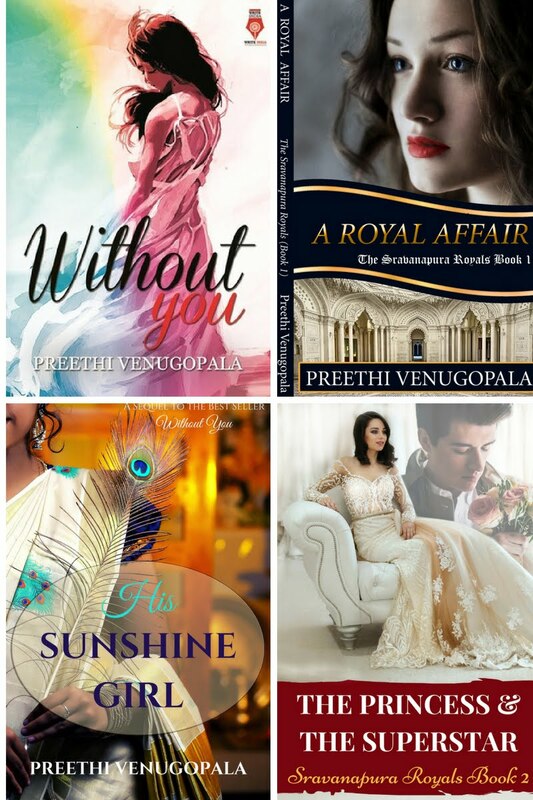 Also since u r a published author, thought wud share the amazon link of my debut novel. You might be interested. Definitely a range of product that is a writer's bliss. How to Write more Every day?